Shortly after she settled into her new home in Minneapolis, Martha (she prefers Marty) Stortz did four things: she became a member of the Seward Co-op, she joined the Midtown YWCA, she took her bicycle in for “retooling” at the Hub Bike Shop, and she took herself on walking tours of the Seward, Longfellow, and Downtown East neighborhoods. And those activities, along with a genuine love for the city and an infectious enthusiasm for Augsburg’s mission, are what make her a true Auggie. Stortz came to Augsburg this summer as the second Bernhard M. Christensen Professor in Religion and Vocation. She succeeds David Tiede, who has taken an interim position as president of Wartburg Theological Seminary. 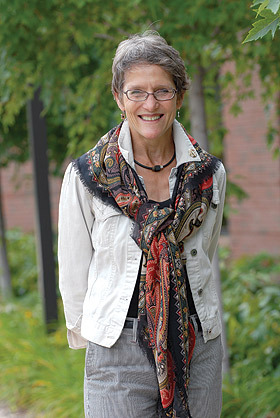 Though some might question her move from California to Minnesota, from theological education to higher education, and from seminary to college, Stortz feels as though she’s called to be here and to bring her connections, an eagerness to share Augsburg’s vision, and a commitment to her position. Gracia Grindal ’65 is a professor of rhetoric at Luther Seminary. She is a poet, translator, noted hymnodist, and creator of Luther Seminary’s annual Reformation Festival, which grew from the “Singing the Faith” Reformation Day services. She received her BA from Augsburg College, MFA from University of Arkansas, and MA from Luther Seminary. Monday, October 4, 10 a.m. The morning class schedule will be amended; see the Registrar’s website for information.